Here with another style post and this time we’re, for the first time in this entire season, talking about fashion week! 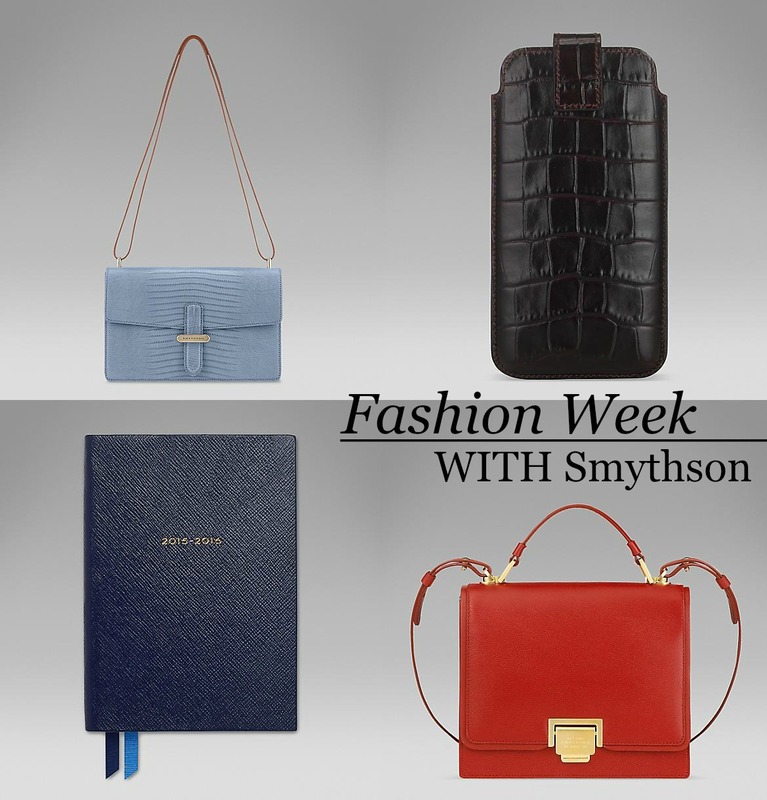 I’ve teamed up with Smythson to talk about what accessory of theirs I would take to each of the fashion weeks; London, Paris, New York and Milan. They stock some seriously gorgeous leather items and I for one am a big fan of their stationary, so let’s get on with the post! Paris Fashion Week | I would go with the beautiful Audley Bag because there’s something so chic about French style that I think this bag would fit in perfectly. Imagine it teamed with a crisp blazer, striped top, ripped jeans and heels. Perfect! Milan Fashion Week | Everyone and their mothers documents FW with their phones now, so why not accessorise that too? I went for that beautifully stylish croc phone case because why wouldn’t you want to get your phone out of that thing? Team it with some sunnies in the matching tone and you’d all be set for some Milan sunshine. New York Fashion Week | There’s always so much going on at NYFW that you’d have to have a diary to keep it all in, and what better than one that’s called Soho! Quite fitting. The Soho Diary comes in that navy shade I’m obsessed with so would look very chic when jotting down when the shows are. London Fashion Week | Obviously kept the best for last, so I went for the Small Shoulder Bag in this bold red shade to really stand out. Red is always synonymous with London, so it had to be done. The size is perfect for all of your essentials and the gold details add a bit of metallic detail. So that’s what I’d team with my outfits for each fashion week – let me know what you’d wear! *This is a sponsored post by Smythson. All thoughts are my own.